Concussions result from body contact in boxing and football. Those who abhor such contact sports and who don’t care to know the difference between and a field goal and a first down may make an exception for tennis. The fans in the stands at Wimbledon are as genteel as the audience at the Pope’s coronation, and would be aghast watching youtube features of football fans breaking heads at the Mercedes-Benz stadium in Atlanta. Tennis, like polo, is the sport of gentlemen, and as an activity for individuals, whether a player wins or loses he has only himself to blame. With fancy scores that baffle Americans who prefer their sports nice and simple, tennis is a game that only sometimes raises tension in the stands and high emotions in the players. 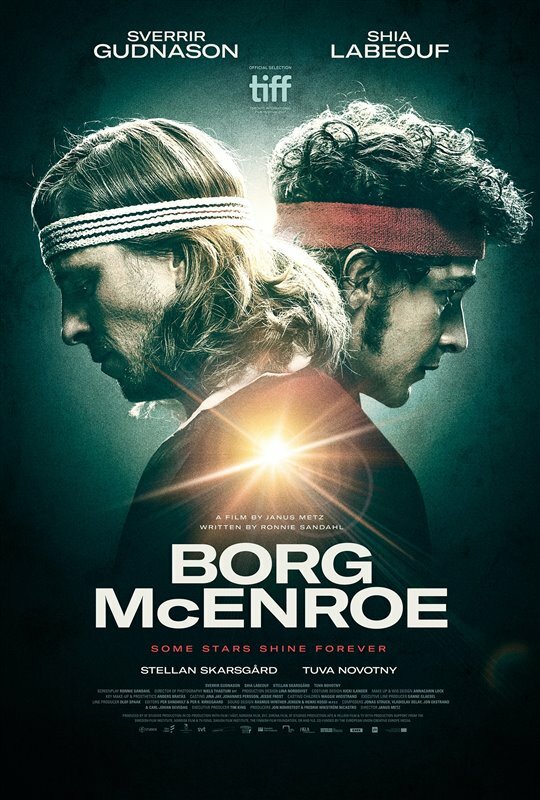 Janus Metz, who directs “Borg vs. McEnroe” from a screenplay by Ronnie Sandahl will likely succeed admirably in getting hearts pounding given the excitement that took place on a single day in 1980 as two equally adept players struggle down to the wire in a match with several overtimes. The winner can claim the title of numero uno while the loser must settle for number two. Given the personality of John McEnroe who was out to topple Björn Borg from his place as the world’s greatest player, we can easily see that the American considered his match at Wimbledon against the reigning champ as a do-or-die fight. For Borg, this was his match to lose. The Swedish sportsman was the favorite even of Americans, given our disgust with the antics of McEnroe, a childish man given over to tantrums against the umpires and line officials, a temperament more suited to throwing opponents out of the ring in professional wrestling than of swinging the catgut in his racquet. Interestingly the part of McEnroe is played by Shia La Boeuf, not exactly unknown to police. Arrested for yelling at New York’s Studio 54 on July 20, 2014 and refusing to leave the theater, then again charged on July 8, 2017 with public drunkenness, La Boeuf—who got his French name from his Cajun father—is perfectly type-cast as the villain. In fact he was bestowed by the sports announcements as the SuperBrat while his Stockholm-born opponent was nicknamed IceBorg. As we see from their behavior on the grass court at Wimbledon, London, Borg, playing as a 25-year-old by Sverrir Gudnason, is considered a gentleman. In truth he shares a temperament with his opponent, the difference between that he represses his emotions and is torn by self-doubt. He is encouraged by his coach, Lennart Bergelin (Stellan Skarsgard), to think “one point at a time.” By focusing all his fears and doubts within, Borg would seem to have the temperament for a winner. With regular flashbacks to Borg’s childhood days (played by Leo Borg, who is the real-life son of the champ , then by Marcus Mossberg), the young Borg practices frequently by hitting the ball against a wall. His neuroses show up later. When the press asks the mature Borg to hit the ball against the same wall, he refuses because he does not remember which specific wall he had used years earlier. The private moments are nothing special. The audience does well to wait for real melodrama when scenes from the big Wimbledon match come, and since you don’t know who will win (though fans familiar with the game already know and critics may reveal spoilers), you will root for your man. Chances are you’ll pick the Swede, but for me as an American who rooted for my home team, the Brooklyn Dodgers, simply because of the hometown location of Ebbets Field, I put my money on McEnroe. The action shots should have concentrated more on showing the whole court where body doubles filled in for the actors. Who cares what each player looks like in close-up when you all you see in those moments is the smack of the ball on the racquet? The rivalry does not have the comic theme we enjoyed when watching Steve Carell and Emma Stone performing in the roles of Bobby Riggs and Billy Jean King in “Battle of the Sexes,” but the intensity of the McEnroe-Boggs game helps to make up for that.